Mark Zuckerberg Ties the Knot with Priscilla Chan! Mark Zuckerberg surprised not only Facebook-fans and others all over the world who know him, but also the invitees of a small ceremony which turned out to be his marriage. This week was extremely happening for Mark Zuckerberg when he became a billionaire with the Facebook IPO on Friday, before which on Monday, his girlfriend Priscilla Chan finished her medical school graduation and they both got married on Saturday! 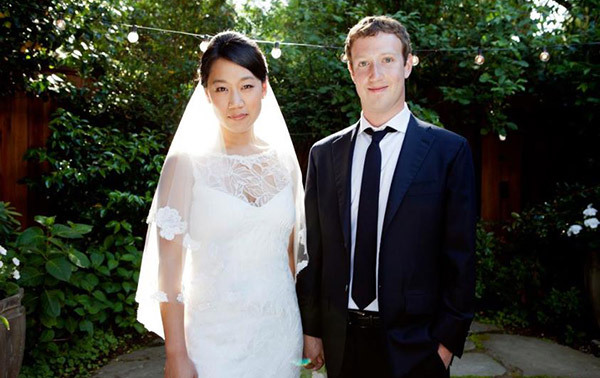 Mark Zuckerberg, the co-founder and CEO of Facebook who became world-famous recently because of the Facebook IPO which earned him billions of dollars, was dating Chinese-American Priscilla Chan for nine years, since they met in Harvard when Mark was studying in the sophomore year. Zuckerberg invited about 100 close people to his house in Palo Alto, California, on Saturday. As Chan has just finished her medical school graduation from the University of California, all the invitees were under the impression that it was celebration for her graduation. And they were pleasantly surprised when Zuckerberg placed a wedding ring on the finger of his long-time love-lady! The wedding ring is said to be designed by Mark Zuckerberg himself and is studded with a ruby. The simple wedding ceremony took place in the backyard of Zuckerberg’s Palo Alto house and was highlighted by a touchy love song presented by Billie Joe Armstrong. Mark Zuckerberg posted his and Chan’s photograph as a wed couple on his Facebook page and changed his status there as ‘Married’.